Point of Sale (POS) is an integral part of a retail business operation. Briefly, it is where a transaction occurs between a business and a customer wishing to make a purchase. Funds are exchanged for a good or service, and a receipt is issued. Modern POS can also keep track of inventory and eliminate the need for physical price stickers by maintaining a price database. POS is already in place throughout most major retail chains and financial professionals and is being adopted by small business owners wishing to embrace technology. Here are some things to consider when shopping for a POS. Customers do not generally like to wait. Business owners would be wise to invest in a POS that is easy to use so customers can shop without expecting long lines. Training cashiers can be a time consuming and costly experience, so it makes sense to use a POS that is intuitive and easy to use. The software should be easy to read, include options that make sense for the business, and include a receipt function for customers. A POS that is easy to use will be invaluable to a business owner. One of the most important considerations for your POS system is whether or not it offers comprehensive reporting tools in addition to returns policy input capabilities. Whatever POS software you decide on should have features that generate detailed sales reports. This is one less thing that you will have to do yourself, which frees up time and cost savings. If you are deciding on a POS software for your business, make sure that whatever option you choose offers robust sales reporting features. The POS a business owner chooses should be secure on both sides of the transaction. If the business accepts credit and debit cards, customer information must be stored securely to avoid unauthorized use of such information. If the business collects customer information such as names, phone numbers, and addresses for catalog sales or business communication, this data must be protected from exposure to the public or unauthorized attacks. On the business side, it is also important that a POS be physically secure. Internal theft can be limited with a POS that locks securely and keeps track of cashier activity. Monitoring funds and cashier activity can alert a business owner to improper money handling or untrustworthy employees. The POS should also be sturdy enough to thwart outside theft; a robber should not be able to pick up and walk out with a POS full of money and important customer information. A business owner should take both sides of the transaction into account when considering a POS. A good POS will last more than a few years so the business owner does not have to repurchase a POS frequently. 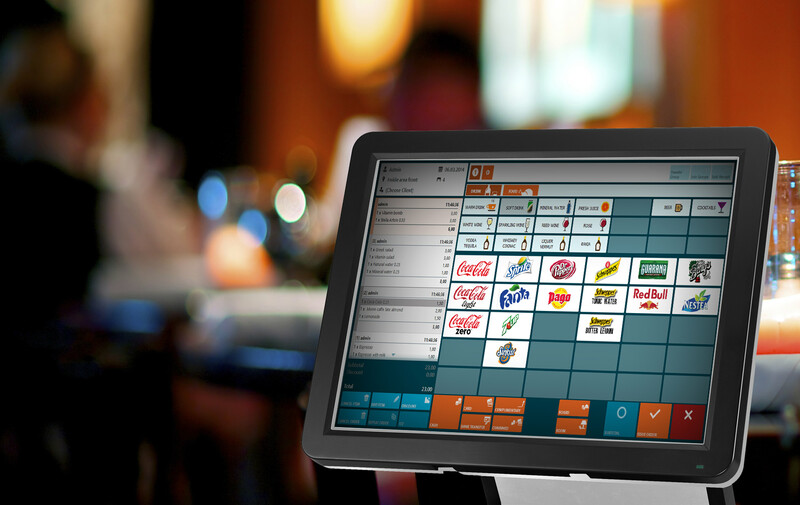 Periodic updates to the POS software is mandatory as business operations evolve over time. Hardware should also be installed in a plug-and-play configuration, meaning that if one component proves defective or requires an upgrade, this can be done without replacing the entire POS. A smart business owner will consider a POS that is future proof to avoid having to spend money on a new POS every few years. A POS generally includes several pieces of hardware: the core computer, a monitor, a receipt printer, a cash drawer, and input devices such as a mouse and keyboard. POS systems are usually connected to a server via a local network, and the internet to upload/retrieve prices, inventory and sales data. Depending on the type of business, a touchscreen monitor may be suitable and worth the investment. Handheld scanners are becoming increasingly popular in retail as the traditional sales floor evolves. The business owner should consider the quality of these individual components, as well as the complete POS, when shopping for a system. A quality POS should only require basic maintenance, but there are times when even the best statistical software systems do not function as needed. it is important that business owners have support options for the POS, on both the hardware and software side. The option for support to remotely dial in to the individual POS or the server could turn a problematic system freeze into an easy fix. A hardware replacement hotline can eliminate the hassle of searching for replacement parts that may not be compatible with the POS. Finally, 24 hour phone support during a busy shopping season could be priceless. A business owner should consider support when shopping for a POS; it may increase the initial investment cost, but can easily pay off down the line. There are many factors a business owner should consider when shopping for a Point of Sale (POS). Price is an important one, of course, but not the most important. A business owner would be prudent to consider ease of use, security, future proof, hardware quality, and customer support when shopping for the perfect POS. It could make all the difference to the business, its employees and its customers.